The rules that govern the game of LCYS soccer. LCYS follows the Local Laws, the NMYSA bylaws and rules as well as the national guidelines. The Local Laws cover LCYS specific modification of the FIFA’s laws of the game (Law 2 – The ball is supplied by the home team, Law 3 – number of players, rosters, player pass cards and substitutions, Law 4 – player’s equipment, Law 7 – mercy rule for the duration of the game, Law 8 – minimum number of players to start and continue a game & Law 12 – fouls and misconduct). The NMYSA General Procedures and Rules define and regulate things such as Duration of games and ball specifications (3.10), Rules of play (3.11- uniform conflicts, substitutions, minimum number of players, forfeiture, referee responsibilities,…), Age limits and age groups (3.03), Registration (3.05), Player releases and transfers (3.14), and much more. Please make sure to read and understand the document as posted at NMYSA web site. 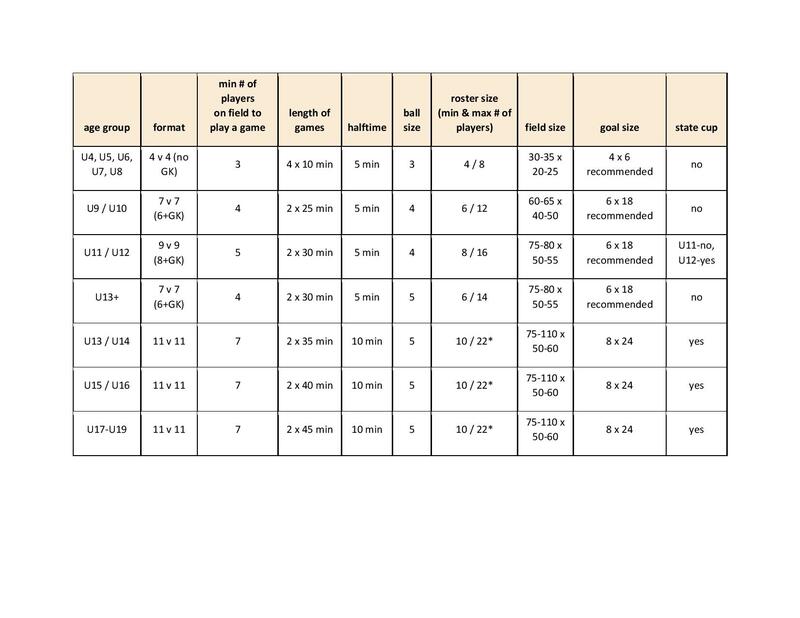 The table below gives an overview of per age group format. * U13-U19 Roster limit is 22 players but each team must only have 18 rostered players for each individual game listed on the actual game roster. Please see the table below in regards to the birth year matrix.